Virtual Pulp Press began as an online store catering to men who like to read. The Two-Fisted Blog was a review site for men's fiction and â€œmovies for guys who like movies.â€ The two combined forces at Virtual Pulp and do all that they did before, plus comment on culture, sports, music, news...and an occasional game. 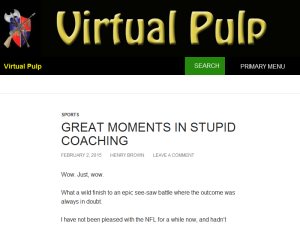 This what your Virtual Pulp Blog Ad will look like to visitors! Of course you will want to use keywords and ad targeting to get the most out of your ad campaign! So purchase an ad space today before there all gone! “ETA approximately one minute,” the officer said after Christina York had given him the ten-digit grid coordinate. “Good copy. Out,” she replied, ending the radio transmission. She was in Ninewah Province in northwest Iraq. Specifically, she was in Mosul, in the part that had once been the biblical city of Ninevah. Thirty-six hours ago she had brushed against a man in the streets, implanting him with the biological nano trackers her superhuman body produced. She had followed him to his contacts, and then she followed them to the safe haven of a company-sized element of Islamic terrorists. She now sat near the middle of a room in a high-rise, positioned behind a table on its side and with a clear line of sight out the window. Her field glasses kept Rashida Abdallah in sharp focus 1,500 meters away. Rashida stood in the center of the terrorists, wildly gesticulating and shouting. She was revving them up to kill more American troops. She was very good at it. Probably their best propagandist. And if she was allowed back into the U.S., she would use her skills to recruit more terrorists there . . . for foreign or domestic operations. Rashida had emigrated from Syria to America ten years ago. She and her family had claimed refugee status, saying that they feared for their lives from both the Syrian regime and Islamic terrorists. Five years ago she had returned to Syria so she could cross the border and help Islamic terrorists kill American troops in Iraq. Rashida raised a poster, showing a photo of dead American troops. She screamed and pointed at it. Her fellow terrorists raised their arms and shouted with her, some of them fired AK-47s. Someone handed her a rifle. Others set up a dummy, dressed in American military gear, a few meters away from her. Everyone cleared her a path. She fired a full magazine into the dummy, creating an even greater frenzy. Christina scanned the skies. Nothing there. The terrorists climbed onto five Humvees and two Abrams main battle tanks that they had either captured from the Iraqi armed forces, or that the Iraqi armed forces had outright given to them. They danced on them and made an even bigger spectacle. A faint boom echoed in the heavens. The terrorists didn’t notice it. Christina smiled. A tiny black blip appeared in the air, growing larger with a light red glow surrounding it. The object moved parallel to the ground until it was directly over the terrorists, and then it started going straight down at them. The red glow turned bright, and a brilliant red streak trailed behind the object. A handful of terrorists spotted it at the last moment. Blood-red fire streamed out of the object, slamming into them with fury. It created a massive impact crater and sent a shockwave outward. Bits and pieces of the tanks and Humvees went up and outward along with flames and smoke; parts of the terrorists too. Christina ducked, closed her eyes, covered up her ears, and opened her mouth. The shockwave reached her, roaring into and through her, and freeing bits of the ceiling to dance down upon her. She waited for ten seconds before opening her eyes. Her eye protection kept them safe from all the debris. But the dust made it impossible to see the impact area for a good thirty seconds longer. Adam White slowly appeared like a black wraith in the middle of it. The superhuman warrior swiveled his head. No other signs of life near him. And then he leapt back into the air. She rushed from the building, instantly blending into the panicking crowds of the city. Amanda, the president, and his aide finished watching the video feed the unmanned aerial system captured of the Mosul operation. His chief of staff sulked out of the room. “Sir, to your last question, ICE is ready to round up all of her family members for deportation,” Amanda said. “Execute that operation immediately,” the president ordered. Artwork © Paul Hair, 2019. I’ve been traveling recently and wanted some audiobooks to listen to. I canceled my Audible subscription years ago, and don’t really want to renew it. I like the idea of a Kobo audiobook subscription because one phone app reads ebooks AND plays audiobooks. So I’ve been perusing Kobo’s store looking for something worthwhile. The first observation to be made is how formulaic and boring the blurbs are, for just about every book. When a book has a blurb that’s not competent or interesting, I lose confidence that the book itself will be competent or interesting. The next observation I made was my own reaction to the accolades quoted in the product descriptions. Rave reviews from some NPC at the Washington Compost are supposed to impress me, but actually have the opposite effect. It’s safe to assume no book will ever again be well received by any of the legacy rags if it doesn’t conform to The Narrative and faithfully push the Overton Window further left. Making the New York Slimes Bestseller list usually gives me the same general warning about the book, and “best seller” is often a dubious title as far as this particular distinction goes. In the landscape of this culture war, if the “mainstream” pop culture svengalis love your work…you’re part of the problem. In fact, if your work doesn’t piss off the commies (and even some of the “moderates”), you’re doing something wrong. We live in an age when the young people living in this country believe socialism is a great idea. Of course, this proves that the Indoctrination Industry (including Public Education) has succeeded in fomenting and enforcing widespread ignorance. It should also scare the hell out of you. What happens when there aren’t enough Americans left to prevent them from completing the Fundamental Transformation? If you believe what is taught in the Bible, then you know that a person doesn’t have to be an overt devil-worshiper to be a tool of the devil, or to wind up in Hell. Jesus said those who are not with Him are against Him (Matthew 12:30). So those who do not consciously choose to follow the Son of God automatically default to the side that is against Him–and you know who is in charge on that side of the aisle. Pretty simple. It’s been easy to notice that Marxists (whether they are called socialists, progressives, Democrats, or “liberals”) speak and behave a lot like their Default Daddy. What’s surprising as how many of them, dating back to Marx himself (and beyond) intentionally worshiped the god of this world (2 Corinthians 4:4) and consciously did his bidding in the system they devised. Twenty years ago some of you scoffed when “paranoid conspiracy whackos” like me warned you that the garbage going on right now was coming to our country. Please get informed while you still can. The clues as to what kind of world our children will inherit are all around you. I only discovered “Edge of Wonder” recently. Don’t know much about them yet, other than that they dispense some good information. If you haven’t accepted the reality of what we’re up against, from anyone else, maybe their delivery will be more palatable to you. What Will You Do Once Big Tech Gags You? For some time now I’ve wanted to build Virtual Pulp’s own online bookstore (rather than just pages of affiliate links). At least with our own cyber-needle in the online haystack, there’s a chance people could find our books once we’re censored off other platforms (until the money-changers also get into the act). But that’s just a measure that could benefit VP. If people like us hope to continue selling books after Big Tech does what they are proving to us they fully intend to do, we need to throw in with each other and build a platform that they can’t control, with servers they can’t shut down, hosting they can’t deny, and payment methods they can’t yank out from under us. How many more of our allies do we need to see censored, deplatformed, or demonetized before we accept that this is necessary? Necessary enough to start making it happen? I’m neither a business savant nor a software engineer, but I know there are plenty of them out there who are not rabid cultural Marxists, and could help us make this happen. The most daunting obstacle to an enterprise like this is, as some of you know, herding the cats. Could we muster a little bit of solidarity for long enough to work toward a long-term safeguard that is desperately needed by all of us who think for ourselves? Could enough of us overcome our normalcy bias and stop chanting, “It can’t happen here! It can’t happen here!” to open our eyes and see that it is, in fact, happening here and we need to act fast? Castalia House has begun making some preparations along these lines, and Virtual Pulp has backed some of their endeavors. But when it comes to selling books, most of their efforts have been focused on their own preservation, which is understandable. They are not responsible for rescuing anybody outside the walls of their own tent. I hope to start working on the VP store this summer, and perhaps further down the road we will welcome other authors into our brand, if they want to join us and write the sort of stuff we want to publish. But the problem–and the solution needed–is of a scope that dwarfs Virtual Pulp (and Castalia House, Superversive, etc.) and anything we can accomplish by ourselves…by orders of magnitude. For what it’s worth, I’m willing to participate in such an endeavor in any capacity I can be helpful. How long are you going to balk at taking action–until it’s too late? How do you assume this is going to be resolved? Maybe the power of your positive thinking will miraculously transform reality into a world where you won’t have to make sacrifices or run the risk of offending somebody. Maybe the likes of Paul Ryan, Mitt Romney and Mitch McConnell will ride to your rescue so you won’t have to lift a finger. If you believed any of that, you probably wouldn’t have read this far. So what do you think? I haven’t read the first Apalling Stories, but do intend to rectify that. An argument could be made that some of the stories are depressing–like classic episodes of The Twilight Zone. At the same time, there’s no denying a significant element of gratification derives from following the character arc of the SJWs who outsmart themselves, feed on each other, and otherwise are hoisted on their own petards. It’s immensely frustrating to exist in this reality wherein the wicked prosper…where there seems to be no limit to their stupidity, depravity, or hypocrisy…yet never suffer the consequences of same. And the “champions” of our side either cower in the face of evil, or betray us outright. Each story is well-written, by authors including the newest addition to the Virtual Pulp blog lineup, Paul Hair. One age-old purpose of fiction is to present alternatives or possibilities–how it could be in a better world. Apalling Stories 2 shows us (often with delightful irony) what it might look like if “social justice” vermin experienced actual justice. We are back stateside, and the nationalist superteam has decided they need to win hearts and minds by fighting crime. Hammer and Rebel are teamed up on patrol to keep the streets safe. But a couple of super-powered folks arrive from Europe to track them down and either kill or capture them. Their job is made easier when Hammer and Rebel, looking for criminals, are accosted by a cop instead. The vampire chick is surprised at how easy it is to take them out. Frankly, I am too…as well as disappointed. But the tension continues to build, and the artwork has improved again. There’s an interesting story arc taking shape–and building (I hope) towards an epic showdown between the European and American superteams. Get Alt Hero 5 here. Read the review of Alt Hero 4. If you are the owner of Virtual Pulp, or someone who enjoys this blog why not upgrade it to a Featured Listing or Permanent Listing?